A trend that has been developing over the past three matches for Rangers has been their inability to penetrate the final third in order to create quality scoring chances. Teams have seen how Rangers want to play & have begun making adjustments to hinder Rangers intentions. Teams, like Dumbarton & St. Johnstone, have been layering their final thirds in hopes of containing Rangers attack once they do enter the attacking zone. In turn, Rangers have been patient, looking to probe the defence but consequently their shot totals are down & in particular their shots in High Danger areas are trending in the wrong direction. In the above graphic, shots in the red are High Danger Shots, while those coming from within the six yard box are considered Very High Danger Shots. Shots within the penalty area, but to the sides are considered Medium Danger Shots (they are within penalty box but the difficult angle gives the shooter less openings available to score & not many goals are actually scored from this area). Shots coming from outside the box are considered Low Danger Shots, they make for beautiful goals – but much of that beauty comes from their rarity. 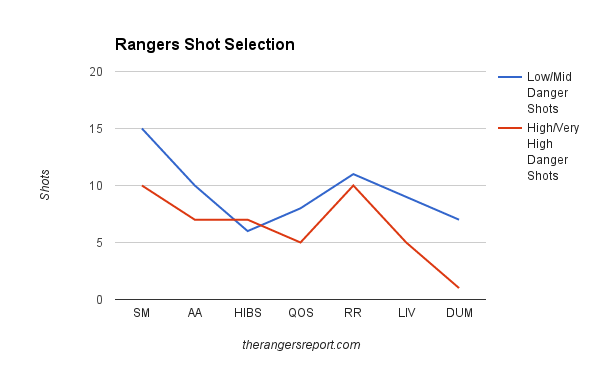 The following charts Rangers shots from their league matches so far this season. Outside of the Raith Rovers game, you see that the amount of High Danger or Very High Danger shots has been in a pretty consistent decline, conversely their Low-Medium Danger Shots have been consistently hovering between 7-10 shots. On Tuesday, against St. Johnstone, Rangers had nine Low to Medium Danger shots & only three High/Very High Dangers shots. Why is this important? The statistical results that accompany shot locations supports Rangers tactical desire to break down the final third in order to create quality scoring chances, however the above data also proves that their execution has been dipping. Note: this data does not include Rangers six penalty shots. Firstly, it has been well-documented that Rangers have not scored a headed goal this season & to be honest it’s a byproduct of not only their style of play, but also is part of a larger trend in the league. Rangers total headed shots are on par with most of the league & there actually has only been six headed goals scored this season by all of the Championship teams combined, with Raith Rovers & Morton scoring four of them. So, it’s not actually that big of a deal that Rangers are not an aerial threat in the box, neither is most of the competition. If you take those headed shots out of the equation, 72% of Rangers non-penalty goals have come from High/Very Danger Shots. They have scored a goal for every 2.9 shots from those danger zones & only a goal for every 12.4 shots coming from Low-Medium Danger Shots. That’s a pretty stark contrast. Even when the shots aren’t generating a goal, they are much more likely to force the goalie into a save when coming from the heart of the penalty area. Of the High/Very High Dangers shots taken by Rangers, 61% have been on target & of those shots on target, 57% have been goals. Conversely, shots coming from Low-Medium Dangers zones are on target 31% of the time & only 26% of those on target shots have been goals. If Rangers successfully penetrates the final third & generates quality shooting opportunities they are clearly a much bigger threat to score then when they are forced to take shots from the perimeter. The available data will only tell part of the story of what’s breaking down in the final third. Recently, I have begun tracking Controlled Zone Entries to see which players are initiating controlled passes or who are carrying the ball into the attacking zone. We also have the shot totals from each player in the various zones…the missing link is what comes in between the entry & the shot — the passing in the final third. This is probably the most crucial data – who is completing those critical passes & who is losing possession? Unfortunately, these statistics are currently unavailable at this level of play. So, instead we’ll look to see which players have been the best at generating shots from dangerous areas & which attacking players need to do a better job of this. Rather then simply look at the sheer volume of shots that a player generates from a High/Very High Danger Zone area, I have broken it down to a per 90 minutes average. This can give us a sense of who is making the most of the minutes they are receiving & it can also help us develop an idea of who could help generate more dangerous shots if given the opportunity. League stats are the only ones being considered & it should be noted that this is still a very small sample size. Additional note: David Templeton’s stats are not included given that he has only played six minutes this season. Dean Shiels continues to be one of Rangers most effective players this season. Part of it is how often & when he is being deployed by management, but when he is on the pitch Rangers outshoot their opponents 29-3, for a mind-blowing Total Shots Ratio of 0.91. I can’t explain it, but he is producing & it is not a surprise him atop of this list. Would that rate sustain with more time, probably not, but his impact on Tuesday against St. Johnstone was tangible as his (new found) direct style of play is sometimes missing from other Rangers players. It is a bit of a surprise, to see Martyn Waghorn & Kenny Miller with nearly identical output. Miller’s shot totals have been waning lately, while Waghorn has been steady throughout most of the campaign so far. So it will see if these numbers stay consistent going forward. Waghorn & Miller are next on the list & of those above them, only Jason Cummings has been a regular starter all season long. There is room for improvement but Waghorn, in particular, has been effective in generating High/Very High Danger shots. His problem has been that his finishing has really let him down. Only 36% of those shots have been on target compared to Cummings who has hit the target on 75% of those shots & his only two misses were headers. That would explain why Cummings non-penalty goals per 90 minutees had doubled up Waghorn’s (0.60 to 0.30). Beyond the forwards & Dean Shiels, Jason Holt has been the most effective player in generating High/Very High Danger Shots, in fact of his seven shots – six have been from these danger areas. The one player whose numbers are surprisingly low is Nathan Oduwa. He clearly has the skills to take apart a defence & he has created a number of dangerous plays with his ball handling magic, but ultimately he is not generating the final product yet. Of his six shots, only one has come from a High or Very High Danger area. Compare that to Barrie McKay, who also has six shots – half of which have been from the heart of the goal area. Of course, McKay has played nearly 230 more minutes, but clearly the next step in Oduwa’s progression is developing a final product that can lead to quality shooting opportunities. Now, remember as was originally noted, we don’t have the data on passing in the final third & it would not be a surprise to see Oduwa being among the most effective players in this area…but again that data is unavailable. The bottom line is that Mark Warburton’s tactical approach has worked wonders so far this season & like any great tactician he will have to make adjustments as other managers create plans to counter Warburton’s initial strategy. It is that ability to make those tactical adjustments that truly sets apart the great managers. Let’s see what happens.